Home > eBooks > Childrens Nonfiction > Curiosities & Wonders > Animal Facts to Make You Smile! These animal facts are sure to make just about everyone smile and sometimes go "awwwe!" 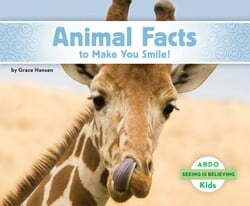 Little readers will learn a cute or funny fact about some of their favorite animals. A colorful, full-bleed photograph will accompany each fact and will certainly attract reluctant readers too. Complete with a... read more table of contents, glossary, index, and even more facts! Abdo Kids is a division of ABDO.